GPU prices dropped considerably throughout the month of March due to a series of factors that include: Amazon and Newegg refreshing their supplies more often, rumors about a possible July launch of the GTX 11 series and a late 2018 AMD Navi launch, plus Bitmain's announcement of the E3 Ethereum ASIC that could spell the end of GPU-based cryptomining. The discrete graphics card market has gone through a very rough patch ever since prices started to rise with the great cyptomining demand of last year. 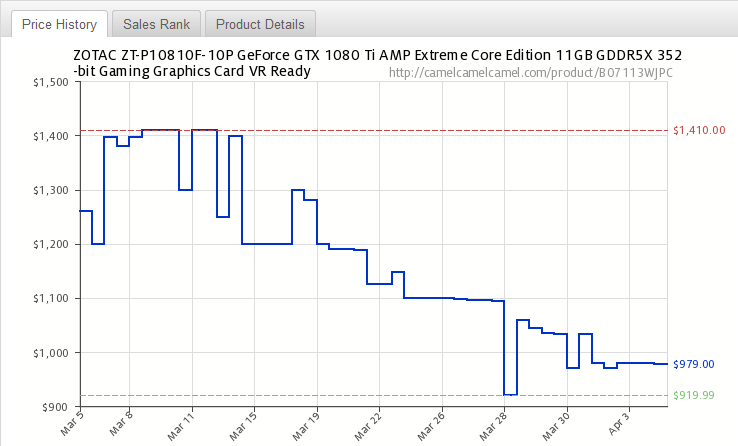 Beginning with June 2017, the possibility of getting any midrange/high-end AMD or Nvidia GPU at MSRP prices was getting close to zero, since retailer stocks were disappearing overnight due to an unprecedented demand enforced by Ethereum cryptominers, and this ultimately angered gamers all around the world. In early 2018, Nvidia and AMD promised to ramp up production in order to meet the demand, and it looks like things are starting to get back to normal, as this March prices saw an average price drop of around 25%. WCCFtech reports that GTX 1080 Ti and AMD Radeon RX Vega 64 prices have dropped almost 30%, from ~US$1,400 to ~US$950. Subsequently, the mid-range sector recorded similar drops, with cards like Radeon RX Vega 56 and GTX 1070 getting prices slashed from US$800/900 down to US$600/700. Apart from the more frequent restocks from Amazon and Newegg, the price drops could also be determined by the imminent launch of next gen cards. In this regard, Nvidia is expected to launch the GTX 11 series this summer, while AMD is planning to release the next gen Navi GPUs by late 2018. Moreover, the prices were surely influenced by the recent announcement of the E3 Ethereum ASIC cryptominer from Bitmain that might render all GPU-based Ethereum mining endeavors obsolete in June. Thanks to this supply stabilization, prices could gradually drop over the past few months, so the upcoming GTX 11 family might actually feature close-to-MSRP prices after all.